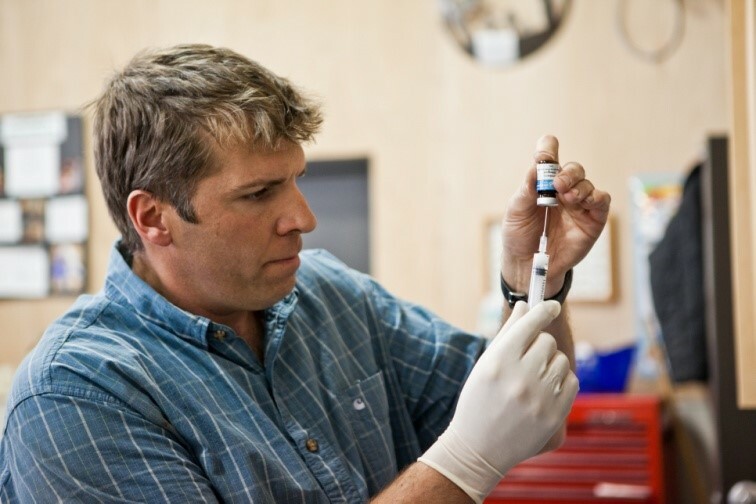 At Alpine Equine hospital joint injections are common procedures which involve injecting medication directly into the joint to combat such problems as synovitis, osteoarthritis, and arthritis. Hyaluronic Acid (HA) is used alone and in combination with a corticosteroid depending on the problem being treated and which joint(s) being treated. A sterile preparation of the joint is performed prior to this procedure to ensure safety Intra-articular injections are performed to sterilely deliver one or more pharmaceutical drugs or other products directly into the joint. The two most common reasons a joint is injected are to anesthetize or “block” a joint during a lameness examination or to medicate a joint to help keep the horse’s joints pain-free. In addition to traditional anesthetics, antibiotics, and steroids, emerging therapies such as interleukin-1 receptor agonist protein (IRAP) therapy, stem cells and Platelet rich Plasma are being used increasingly for horses with joint diseases such as synovitis and osteoarthritis. Joint injury, joint disease secondary to trauma or injury, and osteoarthritis (OA) are major causes of attrition and loss of function in horses. Treatment of these conditions is an important component of maintaining the overall health and mobility in pleasure and athletic horses, and joint injections play an important role in managing joint health in conjunction with other therapies such as nutritional supplementation,weight management, and non-steroidal anti-inflammatory drugs. Intra-Articular Injections: Regardless of the product being administered, the process of delivering intraarticular medications is essentially the same. The joint is cleaned with an antiseptic betadine scrub for 10 minutes. The soap is rinsed off with isopropyl alcohol. Clipping the horse’s hair is often necessary. We then inject the desired drugs or products into the clean joint using sterile needles and syringes while wearing sterile gloves. Horses will require sedation. 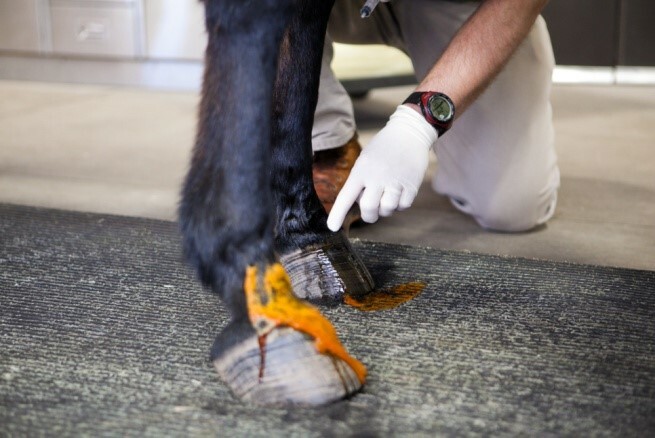 Joint blocks using local anesthetics, such as lidocaine or carbocaine, are important tools during lameness exams to confirm the anatomic structure(s) involved. For example, 15 to 20 minutes after the local anesthetic is injected in the joint, the horse can be reassessed to determine if its lameness has changed. If the horse has improved and is more sound after blocking, then the anesthetized joint is likely contributing to the lameness. Advanced diagnostics and/or treatment then can be undertaken. Advances in imaging the horse's pelvis have made it clear that the sacroiliac joint and its associated ligaments are important sources of lameness in sport horses. In the past, veterinarians treated this area by injecting the more superficial ligaments. Researchers at Cornell University's College of Veterinary Medicine devised a technique for injecting deep below the top of the croup into the sacroiliac joints themselves. We now use this procedure to diagnose sacroiliac joint pain and to treat sacroiliac joint inflammation. It's a straightforward, effective procedure that is tolerated well by patients.